Walking along the streets of our neighborhood, Mongkok, one is sometimes in sensory overload with all of the people walking around, hundreds crossing intersections at once, the neon signs in Cantonese hanging out over the streets, the dripping air conditioning units that splash the sidewalk, the warmth of exhaust as buses pass closely by, the intense smells of stinky tofu and boiled tripe at the corner snack shops, the voice on the loudspeaker as a man demonstrates the newest gadget in front of the street market.............it really is a lot to take in. Coming to an intersection you look across the street and notice a billboard two stories tall with a larger-than-life-size picture of a well dressed man in a suit and assume that he must be a politician or a famous actor. Standing at the bus stop further down you notice several buses that are wrapped in pictures of groups of people in tuxedos and formal gowns - again, assuming actors and actresses perhaps. Then again, you look across the street from the bus stop and you notice a panoramic billboard with another group of 30 or so people, also in formal wear. Not being familiar with Hong Kong sitcoms or movies, besides those with Bruce Lee, Jackie Chan, or Jet Li - you don't think much of it. However, curiosity gets the best of you and you start looking a bit closer to see just what all of the fuss is about with these people. 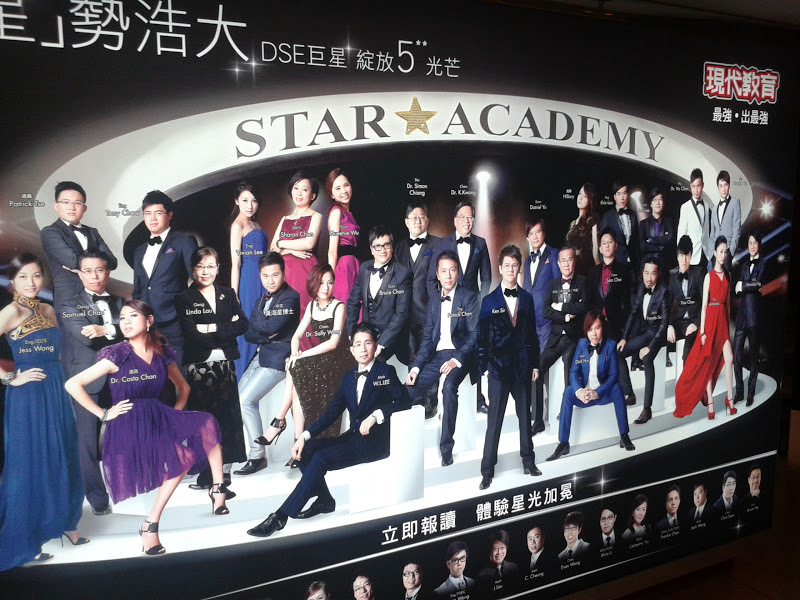 "Star Academy" is looking ready for the red carpet with this line-up. This is a picture just outside one of the tutoring centers. Looks like the gents from "334" are going more for the "Apprentice" look. Another mural covering the wall outside of the tutoring center. I wonder if "Fatheads" would consider making a Hong Kong celeb tutor line? On a larger scale, Beacon College is taking up the width of an apartment building for their advertisement. Welcome to the world of celebrity tutoring! As it turns out, these people are all full-time tutors that are making at least double what public school teachers make - some even making millions. In Hong Kong there is a great deal of pressure to perform on local examinations in order to compete for the relatively few spaces in local universities. 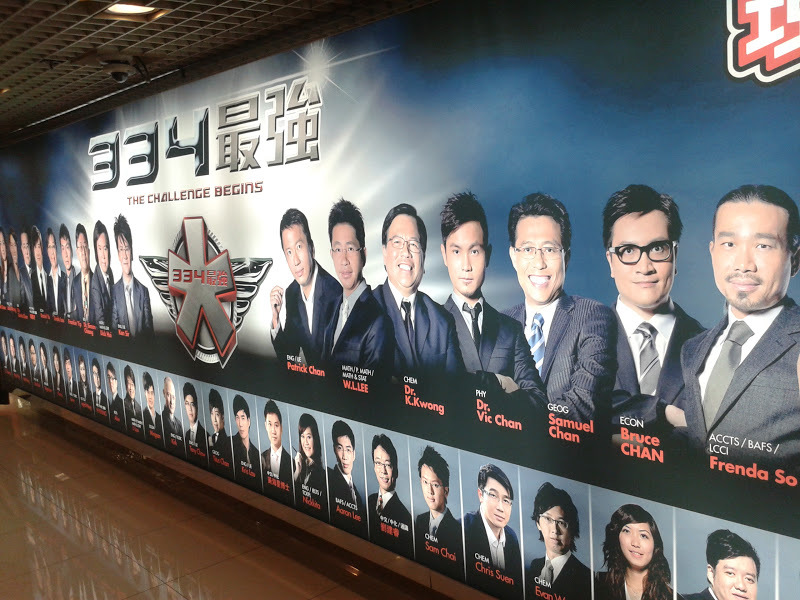 In order to supplement their education and to give themselves an edge on "the competition", thousands of students sign up to attend cram sessions from celebrity tutors at tutoring centers all over Hong Kong. One recent study found that around 85% of secondary students enroll in such programs that offer nearly every subject or examination. ....or this guy "Calvin Sun" who looks like he just graduated high school. Apparently these tutors dress up with their hair and make-up done, and treat it like entertainment while they use a microphone to address groups of students up to a couple hundred in number. It is a commonly held opinion that these tutors, many of which do not have education backgrounds, are more qualified than normal teachers because they are paid a higher salary. The average teacher in Hong Kong makes $60,000, while these tutors are pulling six figures. I know that our school is no exception to this culture, with students even hiring consultants to help them with college applications. The "name brands" mean a lot to these students, who typically only concede street cred' if you attended Oxford, Cambridge, or Ivy League schools. Fascinating or sad, but it's certainly interesting to see how the focus can be very different from culture to culture.